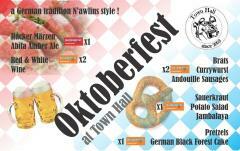 From 4pm till 9pm Town Hall will offer a German and New Orleans beers on tap: Hacker Pschorr Märzen & Abida Amber. 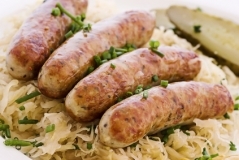 There will also be a wide array of housemade sausages and sides inspired by Bavaria and beyond. 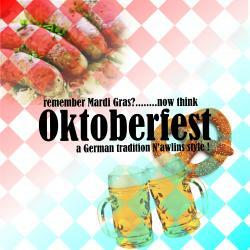 We'll have traditional Thüringer-style Bratwurst, Currywurst (the iconic German street food), as well as a spicy Louisiana-style Andouille sausage. On the side you can select from sauerkraut and potato salad, as well as jambalaya. 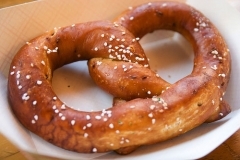 There will be house-made pretzels and German Black Forest cake. And a brass band, too, but one that will dispense with the oom-pah beat in favor of the second-line style of South Louisiana. No Reservations needed for the event, but you can buy voucher tickets here for food & beer in advance online at a discounted price. 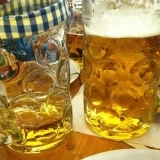 Just come on by and we'll accommodate you on a first-come first serve basis.